In warm weather, there is nothing more fun than playing with water. Besides it being a fun way to pass the time, it also helps your dog to cool down. These fruity cooling toys by AFP absorb water. In warm weather, there is nothing more fun than playing with water. Besides it being a fun way to pass the time, it also helps your dog to cool down. 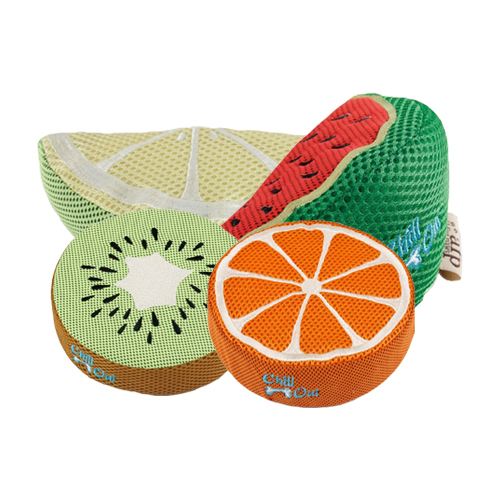 These fruity cooling toys by AFP absorb water. When your dog is playing with this fun fetching toy, water is released into the dog's mouth. The crinkle material and squeaker makes it an irresistible toy for any dog! Have you used AFP Chill Out - Fruit before? Let us know what you think about this product.